These wee spring treats are a quick and easy way to embellish your refridgerator/work cubicle, family Easter basket, and many other possibilities. A small message or a piece of candy can be tucked inside the flower. -Take the fabric or felt that will be used for the ‘message’ embellishment and mark it with a grid so that the pieces measure 2.5 x 1.25 inches (6.35 x 3.2 cm). 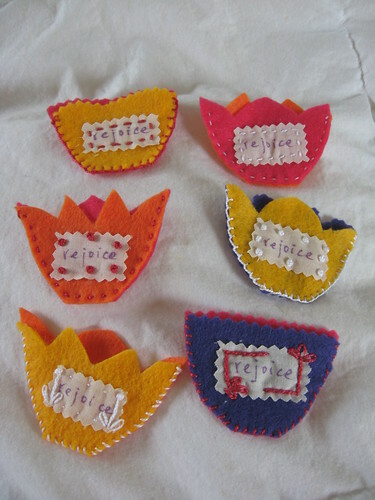 -Use fabric markers or embroidery to create desired message. Make sure to leave margins of 0.25-inch at top & bottom and 0.5-inch at each side – this leaves room for cutting the pinked edge and a seam allowance. 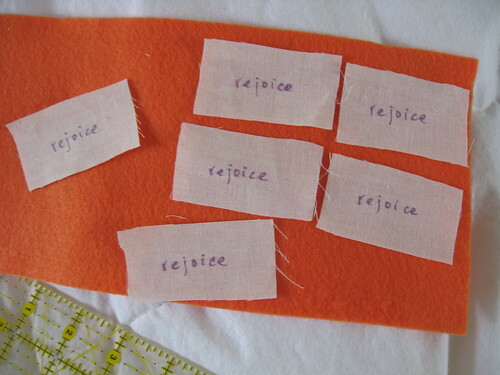 -Use pinking sheers to cut ‘message’ rectangles measuring 2.5 x 1.25 inches (6.35 x 3.2 cm). Trim down after measuring against the cut flowers. 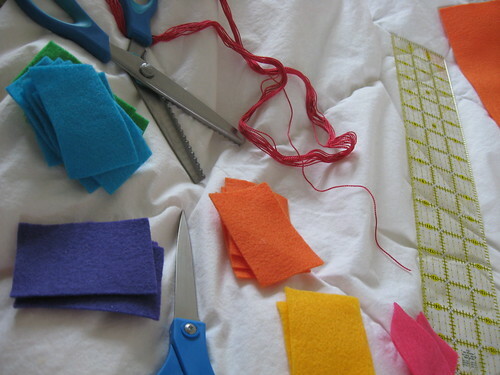 -Use regular scissors to cut felt rectangles measuring 3 x 2 inches (7.6 x 5 cm). 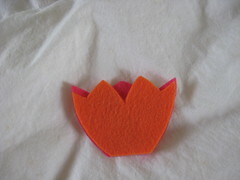 *Stack a set of 2 rectangles together – Front and Back sides of tulip silhouette – and cut curved flower sides. 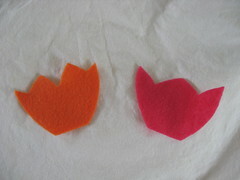 Then seperate the 2 pieces and cut petals for Back side – using regular or pinking shears – then cut Front side a bit lower so that the back panel is visible. * Repeat * to * until each set of rectangles is cut into the flower shape. -Glue magnet backing onto the Back piece of flower, and set aside until the glue is set. 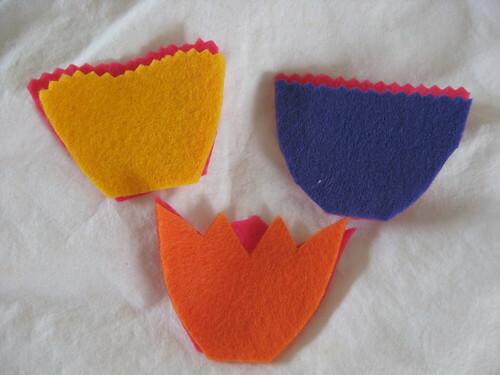 -Pin the Front and Back flower pieces together, then sew along sides and bottom, leaving the top open. -Attach tulips to a headband, barette, bag, piece of clothing, etc. -Use a strip of fabric and batting to create a stuffed ‘stem’ and there’s a quick softie. -Attach to a small wooden dowel and some ribbons, and there’s a spring flower wand/baton. For more sewing goodness, check out this week’s projects at the Sewing Bee.